Despite a higher-than-average number of monthly applications and stock of cases awaiting a first-instance decisions registered in the first month of 2019, figures remain in-line with lower recent trends and fluctuations. 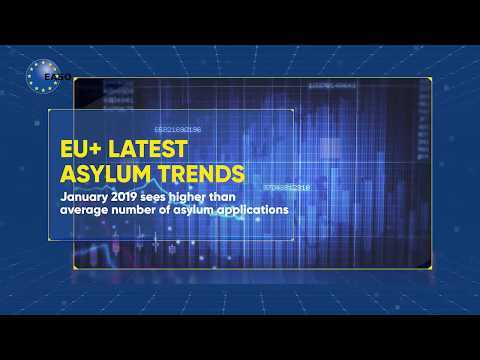 The 31st meeting of the European Asylum Support Office (EASO) Management Board was held in Malta on 18-19 February 2019. The meeting, which focussed heavily on administrative and governance matters, welcomed the strong progress that has been made by the Agency over the past few months in implementing an ambitious set of reforms contained in its Governance Action Plan. The 31st meeting of the European Asylum Support Office’s (EASO) Management Board has selected Ms. Nina Gregori to be the new Executive Director of the Agency. At the same meeting, the Board elected as its new Chairperson, Dr. David Costello, Member of the Board from Ireland, following the end of Mag. Wolfgang Taucher’s term in January 2019. The Management Board also elected Mr. Mikael Ribbenvik as the new Deputy Chairperson. Iran and Turkey among top five countries of origin of applicants. The 30th meeting Management Board of the European Asylum Support Office (EASO) met in Vienna at the premises of the Austrian Ministry of the Interior to discuss the ongoing implementation of the Agency’s Governance Action Plan and adopt its 2019 work programme.